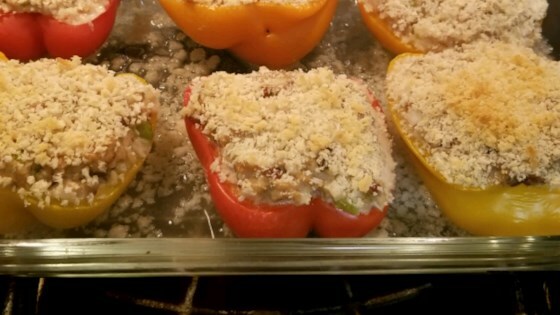 "Delicious tuna spin on stuffed peppers. Even kids love this dish!" Put peppers into a large pot with just enough salted water to cover; bring to a boil and cook until the peppers are just tender, about 5 minutes. Drain peppers thoroughly. Arrange peppers into a shallow baking dish with cavity-side up. Mix rice, tuna, celery, onion, and black pepper together in a bowl; add 1/2 cup plus 2 tablespoons mayonnaise and stir to coat. Spoon the rice mixture into the bell peppers. Pour water into the baking dish around the stuffed peppers. Sprinkle panko bread crumbs over the top of the stuffed peppers. Bake in preheated oven until the bread crumbs are browned, about 30 minutes.